I've just heard that St Paul's Cathedral is suspending its legal action against the anti-capitalist protest camp outside the church. A cathedral spokesman said it intended to "engage directly and constructively" with the protesters "without the threat of forcible eviction". Read more here. Maybe common sense has prevailed. This is after all about the most important issue facing Western society - how to put ethics into economics. 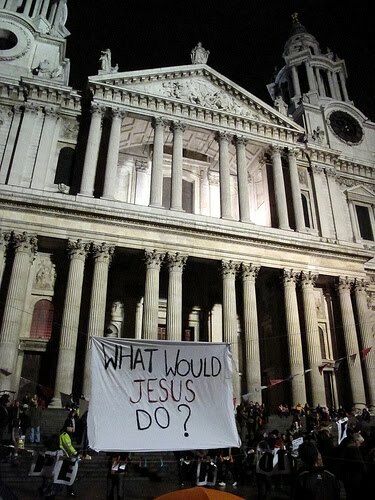 Or maybe, just maybe, they read that banner asking "What would Jesus do?"